Are you looking to convert flash videos to mp4 format? Read to know about the Movavi Video Converter, the best tool for converting flash videos into mp4. Converting flash videos to Mp4 format is an easy task that can be done in a few minutes with a video conversion software like Movavi Video Converter. It is the right choice to convert your flash videos into MP4 format if you are looking for a way to save hard disk space as flash files tend to be bigger size. Flash videos are not optimized for the web and they take longer to load on the webpage. Therefore, if you are looking to post the video online, you should first convert it into a search engine recognized video format like MP4. MP4 offers a higher compression with a low level of quality loss compared to flash video. MP4 is also widely recognized in all major media players. Most sound card drivers are compatible with MP4 videos. You will also be able to play the MP4 video on the smartphone. Movavi video Converter features a simple interface with big buttons and large font size. When you open the software, you will see an open space that states drag your files here. To convert the video file from FLV to MP4, you must first drag the flash video files into the open space. If you have already grouped your flash videos into a folder, you can click the Watch Folder button to import the entire folder of flash videos at one time. Another way of loading the flash videos into the software is to click the Add Media button. The Add Media function allows you to add individual flash videos instead of selecting a folder. There is a small video preview to the left that allows you to preview the video content to make sure that you have added the video. You can preview the video by clicking on the thumbnail once. To the right, you will see an Edit button. You can click the Edit button if you would like to make some changes in the video with the video editor. The video editor allows you to delete unwanted clips, merge additional clips, add audio soundtrack, add subtitles, add text watermark, crop and rotate. You can enhance the video by making several adjustments such as brightness, contrast, magic enhance, and noise removal. The video editor allows you to preview the output video file following the video conversion. You can apply the same adjustments to all the imported video files in the video editor. You can reduce the unwanted noises in the video background in the video editor. You can see what is the expected output quality if you convert your flash video into MP4 format. It also shows the output video size after the video conversion. In this way, you will know whether the file size gets bigger of smaller after the video conversion. The next step is to select MP4 from the Video tab. If you can't find it in the Video tab, you just simply type MP4 into the search box and it will quickly appear in the horizontal carousal. The format you select will be stated in the output format field at the bottom. So, after you select the large Mp4 thumbnail in the carousel, you should look for output format at the bottom to see if it states Mp4. The video editor can be used to stabilize a shaky video so that no one will know that you jerk the camera during filming. Finally, you must choose the destination path. there are several options for configuring where you want the converted video file to be saved. you can save the converted video beside the original video file. You can configure it to overwrite the original video files by saving them in the same file name as the video files. You can also configure it to save the video files in a different folder than the original folder. If you want to watch the video on your phone, you will have to convert it into a mobile compatible format. you must select the Mobile tab and choose your phone brand for example Apple, Android and Samsung. When you click on your phone brand, a scroll list will pop up. You should look for the MP4 format and select your smartphone model. It will states the resolution size and codec used in compressing the video. On the right side of the search box, there is a device detection button. After connecting your mobile device to your computer, you can click the device detection button to allow the software to automatically detect your mobile device model. The device detection feature is a useful feature for people who don't know what is the brand or model of their mobile device. Movavi Video Converter uses Super Speed to convert your flash videos into MP4 format. With Super Speed technology, the video compression can be completed faster. It has been tested to be many times faster compared to other video conversion software. 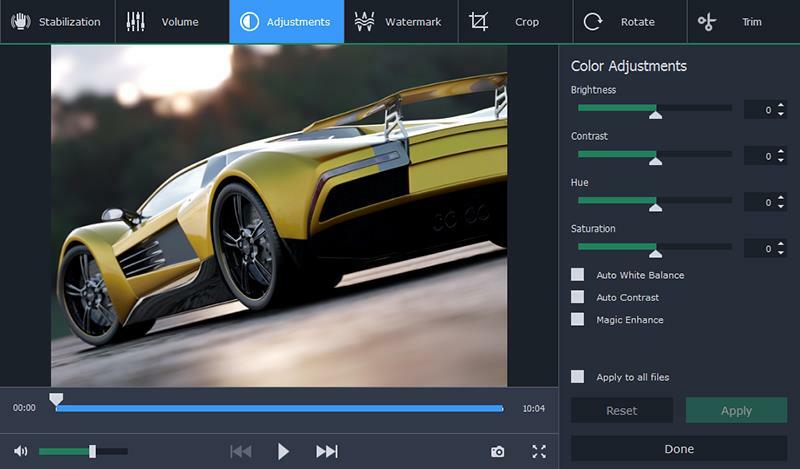 The SuperSpeed mode supports a variety of graphics hardware such as NVIDIA CUDA and Intel HD. If you want to share the converted videos online, you can choose upload to and select the online services where you want to share the video. This prevents you from having to wasting time to upload the video to the online services. When the video conversion is complete, the video will have already been uploaded to your account at the online video sharing services. if you check the join files check box, all the video files that are loaded into the software will be merged. In case you want to merge certain flash files together, you can load them all at once into the software and check this option before clicking the Convert button. This can save you time from having to open the video editor and load the video files to merge them together. The progress bar will pop up and show you how far is the progress of the video conversion. The destination folder that you configured just now will open itself and you can check the videos one by one to see if they are converted into the MP4 format properly. Thanks for the guide, but the converter you recommend is a shareware, you have to pay for it to get the full version, or else there will be a big watermark in the converted video. Actually, there are many online apps can do the video conversion for you, such as zamzar, Acethinker Video Converter, mediaconverter, etc. They are totally free, and you don't have to download or install anything.